Domenico: Did you like the drawing? Fran: It was good. But a bit disorganised..
Domenico: Disorganised? You create that music and you tell me my drawings are disorganised!? Fran: What are you laughing at? Domenico: Nothing.. nothing.. (dying of laughter and rolling around on the floor). Del tutto diverso è invece l’ambito in cui opera il quartetto campano Strongly Imploded, votato ad un’improvvisazione elettroacustica aggressiva e veemente che è parente stretta dei vari progetti paralleli di alcuni membri del gruppo (A Spirale, Aspec(t), etc…). Il loro album si intitola in modo appropriato “Freefall” perché tutto in esso sembra essere in caduta libera, dai fiati che assumono un tono metallico e impersonale all’elettronica free form, dalla batteria che rincorre gli spasmi del suono alla chitarra che precipita in un gorgo di distorsioni. Ricordano i Supersilent dei primi due album per la capacità di comprimere il suono sino alle sue estreme possibilità, e grazie ad un estremo controllo sugli strumenti riescono a dar vita ad una serie di brani tutti egualmente caratterizzati da un’energia implosiva carica di tensione. Yet another Italian trio, this time from Naples, with F. Gregoretti (drums), M. Gabola (reeds) and M. Argenziano (guitar, synth, electronics). After the claustrophobic feeling of Petrolio, the kind of scrabbling, old-timey (that is, reaching as far back as the 70s) approach heard herein feels open and, well, fun. Not that this sounds like a Bailey/Parker/Bennink trio–there’s much more bottom, more oblique nods to metal and other rockish forms (perhaps even Last Exit)–but even at its darkest, there’s a sense of the wide open. A severe grinding aspect is also often in play, the sounds seeming to be wrenched from the players‘ guts. If Caspar Brotzmann had a brother who hewed a bit more closely to his dad’s ethos, he might be involved in a trio like this. Not my cuppa so much, but they do what they choose to do pretty well. 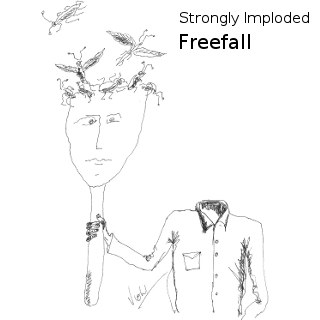 Freefall is a four-piece from Italy specializing in improvised noise and free jazz. They use guitar, reeds and drums along with synth and electronic manipulations gives the eight tracks on “Strongly Imploded” a bite and occasional groove often missing from such outings. With a slow buildup to a jazzy noise mash, using each in ways at once familiar and odd, “Inconspicuous insects and bawdy secrets” opens the set with a flourish. On “An improvised freefalling deconstruction over time,” there is furtive noise throughout, jerking to a halt unexpectedly, careening squealing guitar feedback, sarcastically lazy western harmonica riff in the background. “Plowing through the forest” features a disturbing, digestive groove, the sound of a saxophone choking on its own reed, or eating itself alive. Songs like “Hesitant ham” or “Triumphant march without tattoo or direction” are more generic free jazz freakout: blaring and distorted horns that sound almost conservative in their keeping to recognizable Free tropes. The closer, though, “Illusionary antics with spiraling cyborgs,” is brilliant, a frantic tribal noise intro, that slowly dissolves into a sustained low hum, and an industrial fadeout to a piece that began like ritual music for cannibals. 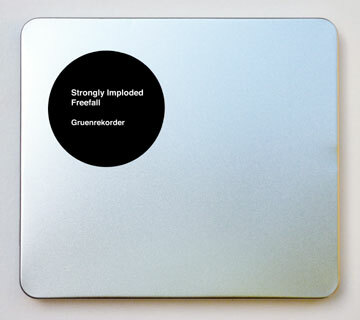 Shamefully limited to only 50 copies and coming in a bulky tin cigarette case, “Strongly Imploded” will probably be more read about than heard. But Freefall deserves to be heard. Their chaos is fun and ferocious, and even with the occasional clunkers, they make daring and roaring music that is quite out and adventurous. 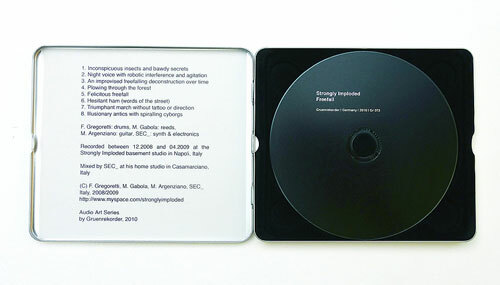 Although the label Gruenrekorder is mostly known for their releases dealing with field recordings, here they also present another side of the coin. Strongly Imploded is a four piece improvisation group from Italy and has members from One Starving Day, Weltraum and A Spirale: F. Gregoretti (drums), M. Gabola (reeds), M. Argenziano (guitar) and SEC_ (synth and electronics). With their background in improvised music from a louder edge, its no surprise to know that also Strongly Imploded sees a similar combination of noise, improvised music and free jazz. They have seven tracks here, no doubt the result of a direct to tape playing, but perhaps with some edits. The reeds of Gabola add a sort of strange jazz feel to some of the pieces, while the others seem more interested in playing a loud as possible, banging away on their instruments. Its music that leaves the listener quite tired after forty one minutes, and although I thought this was on of the better releases I heard from this particular circle of collaborators, I also think this is definitely the kind of music that is best enjoyed when heard live.